When I first started fishing, a wader in warm weather was like wearing a rubber sweat suit. You would exit the river hot and smelly on the outside and dehydrated on the inside. Today’s technology has saved me the torture I use to endure while fly fishing. With the advancement in waders, it can be hard to pick the best fishing waders for your needs. To assist those who are purchasing their first waders or those who are looking to upgrade uncomfortable out of date waders, I have created this guide. Before I brought my fishing waders, I considered one critical factor which was the type of wader I would need. Waders come in three different styles which are bootfoot, stockingfoot, and hip waders/wading pants. Bootfoot waders extend from the sole to the chest area. These waders have an attached boot which cannot be removed. I do not need to purchase separate wading boots, but the waders are considerably more substantial than other styles. Stockingfoot waders do not have the attached boot. They instead have a neoprene sock at the bottom that must be covered with separate wading boots. With this style, I can roll and store them easier than other styles. Hip waders/wading pants were created to be used in shallow, slow-moving water. This style has the options of with or without the attached boot. This style is the most popular because they are easy to get off and on and are incredibly comfortable. • Breathability of a wader is exceptionally critical. It can be the difference between a full day of fishing or leaving after just a few hours. • A stockingfoot wader is more versatile than the boot foot wader. • Another consideration is the weight of the waders, especially during warm months. Redington Sonic-Pro HDZ waders come from a long line of established quality waders. These waders have four layers to ensure waterproof results while providing breathability. These fly-fishing waders have an excellent design for anglers who want comfort while enjoying outstanding features. Some would call these waders the cream-of-the-crop. They are constructed from DWR-coated nylon. They have welded seams to ensure a dry fishing experience. The most significant advantage of these waders is the TIZIP zippered front. Many time while using a wader, I have fallen into the river and have gotten wet because of the zipper. This fact is not an issue with the Redington Sonic-Pro HDZ. These waders also provide a more accessible experience for getting in and out than other waders. • Redington Sonic-Pro HDZ waders have an ergonomic design with a 4mm thick neoprene boot. • These waders have a zippered storage pocket and fleece lined warmer pocket. • All of the hardware for these waders are corrosion resistant. • The boots are attached which can make these waders heavier. • These waders do not have a net attachment or ring on the front or the back. • The attached boots’ largest size may not fit some males. I am someone who wears waders all day long including while hiking from one fishing spot to another. I must have waders that can handle all this and more. When choosing my waders, I wanted a dependable wader that would hold up to wear and tear during usage. I have currently been using these waders for only a short time, but the waders have endured much. The nylon is exceptionally thick and endurable. With previous waders, I have had to worry about errant branches and rocks. The endurance of these waders has removed this stress. The Redington Sonic-Pro HDZ waders even utilize hardware that is anti-corrosive ensuring durability. This endurance suggested that these waders should last for many years to come. The waders have endured the abuse associated with falling on rocks, tangling in barbwire, and running into ice shelves without any signs of wear and tear. Neoprene is the top choice for material when it comes to wader. It also makes the waders more lightweight and flexible than other material. I enjoy fishing in cold weather and neoprene helps to provide an extra layer of protection. The booties of the Sonic-Pro are made from neoprene and are 3.5mm thick everywhere except for the sole of the bootie. The bottom of the bootie is 4mm thick which provides more protection where it is needed. This extra thickness helps to prevent the development of pinhole leaks in the soles. The HDZ waders have remained stiff and resilient after continuous usage without feeling bulky. The most common style of waders is chest high because they are the most versatile and most men would agree with the best overall choice. This type of waders can be used in shallow water during warmer weather and can be used for deeper water and colder weather. When the creators designed the Redington Sonic-Pro waders, they gave it a great deal of thought and consideration. I love the overall design of these Redington waders because they keep me warm and comfortable every time I use them. With seams that are sonically welded to eliminate leaks and sticking holes, the Redington Sonic-Pro HDZ Men’s Waders are excellent for those people who enjoy fishing in waders. When I go fishing, I get to know the stream really well. I have fallen into it so many times that I always take a bit of the stream home in my ears. I also typically go home soaking wet. The first day I wore the Redington Sonic-Pro waders was no different because I took a plunge down into the river up to the middle of my chest. I was pleasantly surprised when I emerged relatively dry. The waterproof TIZIP zipper worked perfectly. This zipper starts at the top of the HDZ wader to just below the waist of the wader. Though-out the day, I took several falls and belly-deeps without an issue of watering entering through the TIZIP. TIZIP has proven to be excellent and has become the industry standard for the roughest waterproof backpacks and duffels which includes the YETI’s Hopper line of soft coolers. The HDZs waders are the first waders I have ever worn with zippers, and I love the convenience that it adds. The functionality of waders can be an essential feature for some people. Redington Sonic-Pro HDZ waders has incorporated a tool dock on the front of the waders. This toolbox is a fabulous place for hemostats, zingers, or anything else. The inside of this tool dock has an internal flip pocket which is an ideal place for a small fly box and a wallet and IDs. Both of these pockets can be zipped and are waterproof to protect your items such as keys, cash, wallet, etc. At first, with only these two pockets, some men may complain because other waders have multiple pockets. However, if you fill a variety of pockets, you will just be weighed down. After a while, you will probably realize that these two chest pockets are all you need. These waders also have two hand pockets lined with warming fleece on either side of the bib to ensure your spare hand will keep warm. These pockets do not have zippers. This fact can be a blessing when the weather is cold outside, and you are trying to unzip a zipper with cold and wet hands. The lack of zippers makes it easy to slide a hand into the pocket to warm it up. However, the lack of zipper makes it difficult to store any items. The suspenders attached to these waders are soft, comfortable to use, and comfort and can be adjusted to various sizes. When I go fishing, I always take my license, some cash, and my cell phone. Each of these items takes away space from my fishing equipment. Many people suggest to put them in my jeans when my waders do not have enough pockets or storage space. This practice makes it hard to reach my phone in an emergency. Redington Sonic Pro HDZ waders have the perfect solution to this issue. They come with a detachable pouch which is waterproof to protect valuables. As state previously, the waders also have two inside pockets. One of these pockets is waterproof while the other is a Velcro pouch. Each of these pockets provides extra storage space and are large enough to carry three to four fly boxes. In the past, I have always thought when wearing waders that I needed more storage room. With these Redington Sonic-Pro HDZ waders, I feel like I need to purchase more fly boxes, rolls of tippet, and other items to fill the available storage space. When wearing these waders, I always feel like I have more than enough room for everything I need. For waders to be breathable, they must be made from a variety of compounds. These compounds include such things as GoreTex, Toray, and other materials which keeps water out while allowing heat and sweat to escape. This ability allows the user to stay warm, comfortable, and dry the entire day of fishing. If an angler spends much time in waders, a great pair of breathable waders is a critical piece of equipment. Redington Sonic-Pro HDZ waders are made with four layers of waterproof and breathable fabric. This fabric is nylon that is coated with a proprietary DWR covering. This fabric goes up the thigh and around the seat which gives an extra layer of protection in the seat area. I even add layers when fishing in colder weather to ensure comfort. These layers also add protection while still allowing breathability. This layer of fabric also gives extra strength to this area which is useful when the wearer is sliding in and out of a boat. When the weather is warm, this fabric also helps prevent overheating. Redington Sonic-Pro HDZ waders have a thin nylon wading belt. Some users may think this seems a little cheap for a nice pair of waders. However, I personally like the thinner belt compared to the traditional thicker belt you find on premium waders. The wading belt thickness makes it easier to slide bear spray, a knife, or other wading items on it. This belt can also accommodate the majority of pliers and staffs. Other waders have a more utilitarian belt requires fewer belt loops, but I do not mind the extra loops. The ease of putting extras on the wader belt eliminates any negativity associated with the extra loops. If the Redington Sonic-Pro HDZ waders are not the appropriate waders, some alternatives include Compass Deadfall, Webetop Overalls, and Sougayilang Boot-Foot Chest Waders Waterproof Fishing Hunting Boot Waders. Compass Deadfall waders are an excellent choice for the fisherman who likes knee and shin reinforcement when trudging through the water. These waders also provide an impressive amount of storage with its fleece-lined zippered pocket. With five size options, the user can find the perfect match. The suspenders on these waders are elastic and stretch to ensure a perfectly comfortable fit also. These waders weigh only 2.6 pounds for those who want a lighter wader to carry. 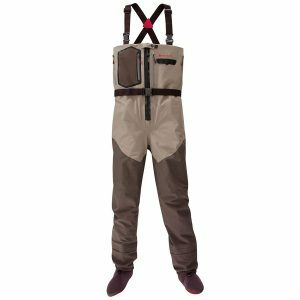 Compass Deadfall waders are priced cheaper than the Redington Sonic-Pro HDZ making them an excellent choice for first-time customers. The features of these waders also make them an ideal choice for cold weather fishing. The Webetop Overalls has a simple design which is the basis of their appeal. With these overalls, it is easy to climb in and out without issue. They are also super easy to adjust for various heights. The one inner pocket allows the user to store a variety of small essential items safely. When compared to the Redington Sonic-Pro HDZ waders, some users have complained about the waist and chest area being too large when brought according to shoe size. It does not have any chest pockets for larger items which are good because of the chest area being too loose. However, these waders are a fraction of the price of the Redington Sonic-Pro HDZ waders. 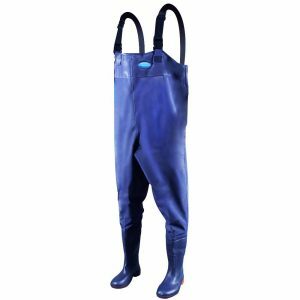 Sougayilang Boot-Foot Chest Waders Waterproof Fishing Hunting Boot Waders are durable and waterproof just like the Redington Sonic-Pro HDZ waders. 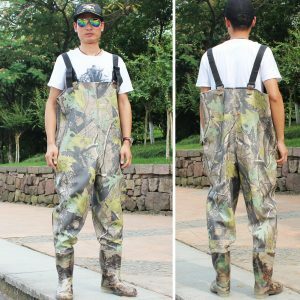 These waders are made from flexible PVC. This type of construction provides long-lasting protection from cold water during the winter months. They also have one chest pocket but do not have the inner pocket like the HDZ waders, so storage is limited for personal items. They do have mesh vents to provide ventilation when the user is hot and sweaty. These vents help to eliminate the perspiration buildup that causes discomfort and overheating. As with the Redington Sonic-Pro HDZ waders, these waders’ suspenders are adjustable for various heights. They are also built to withstand heavy everyday usage.